My name is Kat and I am based in the Fareham/Southampton area. I opted for the name 'Doric' due to my own Scottish roots and also those of my husband. Scotland is a special place for me. My first show Syrian was a boy called Shaun the Sheep. He was allegedly a short haired rex cream roan but wasn't a very good example of any of those aside from his beautiful rexiness. I had to admit defeat regarding his show career but I learned a lot from that point. I started out breeding Roborovski hamsters in early 2013 and moved to breeding Syrians and Chinese shortly after. Initially opting for a couple of colours Doric has expanded over the years to include a few traditional colours and some new ones. I'm also lucky enough to have complete my Syrian hamster judge training at the end of 2015. I won my first Reserve Best in Show with a Syrian from my second ever litter, Dougal. He was a short haired black. I've always loved black Syrian hamsters. They rarely do well against the other, typier colours like creams and cinnamons but my aim was initially to improve my animals enough to win a Best in Show trophy with a black hamster. As it happened my first Best in Show win was in 2013 with my first Chinese hamster bred by Vectis, Wee Jock. He won several Best in Show trophies and two certificates of merit before retiring, just missing out on Champion status. He sired just one litter and his son, Mightily Oats, has gone on to win a further two certificates being shown under Vectis. His grandson, Jame, has also enjoyed an amazing show career. 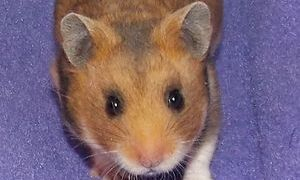 Jock was my first show hamster and is sorely missed. My main passion lies with the Roborovski, a somewhat neglected species in terms of standards at the time of writing with only one main class despite there being several colour mutations in existence. I hope to see more of this species on the show bench over time. Perhaps more than just one holding champion status! Doric is very much a hobby and I don't breed commercially. I previously ran an animal rescue for four years and I previously worked in as an auxiliary veterinary nurse for two years. Please see the FAQ for more about me and what I do. Ethical, to me, means a breeder who follows a code of practice that is designed to improve a species. For example, breeding healthy animals. It also means that you should support those animals that won't win rosettes. What does this mean? Giving time and space to creatures who have become homeless, or offering help to those who can do this. Part of being ethical means being responsible for those animals you have bred. Taking in those that need to come back to you and homing, or help to home them on. Please see the code of practice for more information. A hobby breeder is one who breeds for the purposes of exhibiting animals with their chosen fancy/club. Sometimes it can also mean breeding new varieties, that may not be able to be shown, for the purposes of investigating, recognising and standardising new genes/varieties that can then be exhibited. At the time of writing (April 2019), I breed Roborovski and Chinese hamsters. Please ask if you are after a particular colour and I will let you know what we are expecting. See the Litters page for more up to date info. I may choose not to rehome the newer colours, particularly if they have yet to be standardised as they need to become established in the club first. I have been breeding since 2013 and I joined the hamster club in 2012. I ran my animal rescue for 4 years from 2011 to 2015 handling over 400 rodents. I'm always happy to offer advice to newcomers or direct them to other, more experienced breeders. What do your animals live in? Cage sizing can be a very tetchy subject. My breeding animals live in caging that is appropriate for them with breeding hamsters living in 60cm long cages. I don't use lab cages or racking systems. I do use bin cages for my hamsters as they find it harder to chew 6mm mesh and I find it easier to stack them. Space is important as a breeder, but as a hobby breeder I can sacrifice numbers to give everyone cage space that I am personally happy with. The number of animals here will always be limited by space. Am I registered or licensed? My prefix is held on a list by the NHC and I pay for that prefix to continue each year. The NHC does not inspect their prefix holders. I am required to follow the code of practice and, although they'd prefer it not to be known as registered, this is what many of you view as such. If I didn't follow this code I could lose my membership, and therefore my prefix. As I am an exhibitor and do not sell for pet shop stock I do not require an animal activities license under the new animal welfare laws (Oct 2018). What age do you breed, how many litters does each female have and how old are they when they retire? All this information can be found in the National Hamster Council code of conduct. In short, no animal under the age of 4 months is bred from. No animal will have more than three litters depending on litter size and success. This means that a female hamster who has successfully had two small litters may have a third, similarly a hamster who has had two failed litters might be retired from breeding rather than cause any stress or risk of ill health to her or her young. Mums have time between litters before being bred again. What do you mean by 'retired from breeding'? I mean, placed in a pet cage and left to live out the rest of their lives being giving all of the TLC they need. Breeding animals don't always have a million toys as I feel it's not safe for them to give birth on a bridge, on a shelf or in a tube so it's nice for them to have all these things when they retire. I occasionally rehome retirees in certain circumstances to pet homes. *Note that all my hamsters always have enrichment whether breeding or not. Do you always have animals available? No, I'm not a pet shop or commercial breeding facility! There will likely be a wait of a few months or longer if you are after a particular colour. If you are an experienced home, do consider a rescue animal. Ethics and availability do not go hand in hand. I breed for me primarily and the animal's welfare comes first so this governs my waiting times. Do you breed rescue animals? Absolutely not. Not only have they been through plenty of stress from moving from home to home or neglect etc, but I'm after pedigrees. Although not all breeders provide these, there is at least a known line and health issues can be avoided. This is not the case with rescue animals, some of whom have already been bred irresponsibly. Do you place your animals into the rescue system? No. If I have a litter that doesn't find a home then I care for them here and stop breeding until I have space. Older animals are retired with due care and stay here until poor health or quality of life deem otherwise. I don't do sibling breeding or father/daughter mother/son breeding as a general rule. I use Kintraks to make sure I keep careful track of who is related to who and by how much. A certain amount of inbreeding is either inevitable or, on occasion, necessary but the key is making sure the individuals are healthy. I feel a balance of inbreeding and outcrossing keeps lines healthy and highlights any inherent health issues. The key is to stop breeding once these become apparent. No. I have made this choice to suit my personal ethics. Animals who are sick will be euthanised if treatment fails, or is inappropriate. For example, surgery on an elderly hamster may not be appropriate. Some treatments can be outright unnecessary and more for the owner than for the animal.